Prospective officers are required to attend at least three squadron meetings before we process your membership application. This way, you have the chance to determine for yourself if CAP is a good fit for you before you pay the membership dues. During these first three meetings, you will be introduced to the other officers and the Membership Committee. Once you have decided to join, submit TWO COPIES of your membership application AND one completed FBI fingerprint card, along with a Membership Dues check for $79.00 made out to, "Civil Air Patrol," and an initial Squadron Dues check for $60.00 payable to “Civil Air Patrol – SQ188”. You will also be required to bring TWO forms of photo ID for inspection. All prospective new members must be screened by the squadron membership board. Once the membership board approves you as a new member, then your application and FBI fingerprint card are sent to national headquarters for final processing, which includes an FBI background check. Assuming you pass the FBI background check, you should expect to receive your membership card in the mail three to four weeks after we send your application to national headquarters. You can still participate in squadron meetings while waiting for your membership card, but until your FBI background check comes back to us "clean," your interaction with the Squadron will be limited. Every squadron has many jobs that need to be performed to make the squadron function. You will be expected to hold one of these jobs. For example, you might decide that you would like to train to be the Communications Officer, Finance Officer, Personnel Officer, Administrative Officer, Recruiting and Retention Officer, etc. The list of available positions is large (there are many more than are listed here). Don't worry if you don't have any experience with a job you might be interested in, we will train and mentor you to perform well in the job of your choosing. Visit this link, and scroll down to the publications P200 - P229 to see all of the available squadron jobs and what they entail: Click here. Aside from your squadron job, you can also train and become qualified to perform emergency services missions as aircrew, ground team, or mission base staff. This is exciting, rewarding service, often performed directly on behalf of the U.S. Air Force. Ask us about it! Finally, you must stay current with monthly Safety requirements and attend the Squadron twice per month for the first year training, and the monthly All Hands Meeting. A note to pilots: pilots are required to perform at least one non-flying job within the squadron (see above). All new pilots will be expected to begin training up to mission pilot qualification as soon as possible. No pilot who wishes to serve as a pilot in CAP should expect to join who is not able and willing to become a mission pilot. As a CAP volunteer, your rewards are not monetary, but they are as tangible as money in the bank. Nothing compares to the sense of satisfaction that comes with a job well done, particularly if that job is saving lives or aiding communities. As a CAP member, you will be recognized as a vital member of a national team with a tremendous heritage of serving those in need - and doing it well. 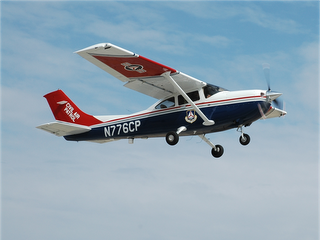 Advancement in Civil Air Patrol is clearly visible to your friends, family and business associates by the distinctive CAP uniforms with their military-style grade insignia, ribbons and badges. Some members choose to quietly serve and not wear a uniform. Meetings and Conventions: CAP members gather regularly at meetings and conventions around the country. There is also a national convention held in a different city every year. Air travel to and from the convention may be provided by the Air Force if available. CAP Supply Depot: Civil Air Patrol operates a depot in Amarillo, Texas, which carries a large stock of aircraft parts and equipment at discount to members for their own aircraft. Communications equipment of all kinds is also available. CAP Credit Card: Earn points with the freedom to redeem for cash back or other rewards. The Civil Air Patrol Platinum Plus® MasterCard® credit card with WorldPoints® rewards gives you the flexibility to choose from different types of rewards – Cash, Travel, Gift Certificates, Merchandise and much more. For more information on how to become a Senior member of CAP, please visit the CAP National recruiting page, which will provide you with general information and an online form to request additional material. Once you have received the information packet (or before, if you wish) please contact us to arrange to visit the Oakland CAP Squadron (local map). If you are interested in membership or have further questions, please contact us or call 510-877-7620.